The sound of Black Spirituals is an amalgamation of various disciplines, lineages and motifs. The duo featuring percussionist/drummer extraordinaire Marshall Trammell and sonic explorer Zachary James Watkins has displayed from day one their tendency to investigate the far edges of the music spectrum. Channelling the improvisational corners of rock, the spirit of free jazz, the modularity of drone music and the processional, ritualistic element of world music, with an African perspective playing a pivotal role, the band has unleashed a series of great releases. The band's debut record Of Deconstruction first displayed their tendency of mixing these elements to create a sound that is immersive and appears to boundless, something that carried on until this day with the release of their latest record Black Access/Black Axes. This is a pivotal record in the band's discography and most likely the final chapter in the Black Spirituals book. In this double record the duo takes its music to new extremes, diving deeper than ever before into free improvisation and constructing a wonderful journey through off-beat tempos, soundscape craftsmanship, ample feedback, fluid drumming and sonic manipulation. The introduction to the album is provided with Watkins' guitar in “Inference,” which displays the exploratory sense of the guitarist on full effect. Without remaining static over the notions of scales and chords, Watkins makes use of the feedback in order to mould the atmospherics of the record. The distorted form of the guitar provides an ample amount of dronality, with a sweeping effect in the start of “Dissenssion” building an impressive space filled with a dystopian scenery. The guitar continually morphs through this work, with the high-pitched feedback of “Pan” producing a different flavor over the circular motifs of the album, while “Demic” sees the sound take on a more granular effect. However, there are times when this mechanic collides with the rock roots of the band, resulting in moments of pseudo-rock grandeur, in “Dissension” and “Reconciliation,” which further display the avant perspective of Black Spirituals. No matter the case, the guitar constructs the scenery and the background elements of Black Spirituals' music while Trammell's versatile drumming is established as the driving force of the record. Over the feedback the fluid performance sees the drummer take the lead, creating moments of sonic dissonance with his complex, improvisational rendition. Furious and aggressive playing highlights many points of the record. At the same time the more direct manifestation of “Container”, presents a counterweight to the more drowsy and prolonged guitar drones, while spectacular solo performance of “Anti Up” displays the full extent of the drummer's creativity. The grasp Trammell possesses over the dynamics truly shines on the solo parts, but it is also a central element to the record as a whole. In this manner he is able to retain the interest and attention of the listener through the record, and provide the necessary push. No matter if the track requires a processional, ritualistic pace or a swift and erratic rendition, Trammell delivers a tour de force performance through an uncanny knowledge regarding the feeling of each part and its intensity. This break from the norm when it comes to structures is attained by the underlying, repetitive progressions that Black Spirituals unveil. The opening track is a perfect example of this ability of the duo in using the feedback as an anchor to this unearthly mantra, while the drumming arrives in the form of a complete outbreak. Deviations on the part of the guitars provide a further, hazy layer to the movements of Black Spirituals, while the use of electronics adds more depth to the impressive passages. “Condition” sees the band build a track through this process, enhancing the spiritual element of the music with this mesmerizing performance, allowing Trammell's drumming to slowly unfold and take its place amidst the haze of effects. In this case the experiment results in a moment of strange serenity, which adds depth to the already complex sound of Black Spirituals. However, similar excavations, as is the case with “Want”, end up in more obscure places with a darker quality. 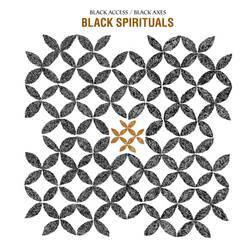 Black Spirituals pour all of their creativity and potential into this double record. The process results in Black Access/Black Axes becoming a towering example of the free rock spirit, as channeled by two very gifted musicians of the experimental scene. If that is indeed the closing chapter for the duo, then they could not have done better. Posted Sept. 3, 2018, 10:40 p.m.